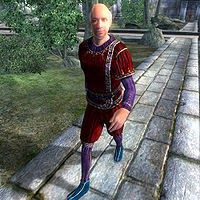 Amantius wears typical upper class apparel: a red velvet garment, a red velvet blouse, and blue suede shoes. He also carries with him at all times his house key and a small amount of gold. He does not, however, carry his diary with him - it is in his house in the desk drawer, near the basement door. He also seems to be very paranoid and comes off as a very strange man.